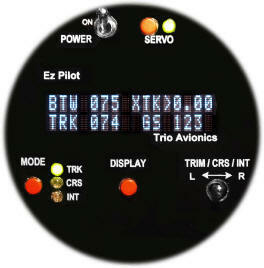 Recently I was able to test a new version of Trio's single roll axis autopilot. I have been running the Navaid for 1000hrs and was pretty happy with it. It WAS the only game in town so I really did not have any comparisons. Here are some things that have always annoyed me about the Navaid unit. 2. When you engaged the unit you had better hold on. There is no telling what it might do. IT could roll into a 60 degree bank and scare the bejesus out of you and your passenger before it gets stable and presses on. 3. It was stable in turbulence, but not real stable. 4. Tracking was always off one way or another. Not by a lot, but always off. More annoying than anything. 5. When I keyed up the mic, again you had better hold on. It could roll you upside down. 6. When intercepting a course, it would overshoot, undershoot, overshoot, undershoot until it got on course. IT would never nail it. If you had an approach loaded, it would shoot you right through the FAF and there was no hope of making the runway unless you got on the final approach course miles before the FAF. 7. Every conversation with Navaid for the past 3 years about improving their unit resulted in me ending the conversation with a feeling that these guys will not be in business much longer. 2. The direct plug into my existing Navaid servo really was the right plug! 3. It's small. Less than 3" deep. 1. A display has has data on it. At first I did not see this as any real benefit until I flew it. My 430 moving map, and I am sure yours too, displays important data fields that you use and need constantly. Ground speed, track, distance to waypoint etc are all important. What is also important is the moving map real estate space. Those fields take up valuable real estate on the moving map. This trio displays those fields, and cycles through others freeing up the moving map to use up all the screen. This is extremely valuable. In fact, in my report to trio, I recommended then add more display lines for more data to display. 2. Intercept mode. You can read the web site for what it does. Ill just say it works just as advertised and is extremely accurate. Even if the direction you need to go is behind you, it makes a real nice teardrop course reversal and nails the course line. Obviously this thing is smart and doing some pretty good math to handle that maneuver. Navaid would not even drop me in the same county if tried that. 3. Adjustable course track. Dial in .97 deg. heading, and that's what you will fly. In either the TRK or CRS mode, if the remote servo disconnect switch is activated, you can fly to any new course desired and, upon releasing the switch, the autopilot will enter the CRS mode and track the new course over the ground. SO the next time you are told turn 10 degrees left, you can either dial in 10 degrees left, or release the servo, turn manually 10 left, and reengage the servo. 4. Excellent turbulence performance. It reacts so quickly, a noticeable improvement over the Navaid. 5. Plugs in quickly to an existing Navaid servo. I am not kidding you when I tell you that installation took less than 3 minutes. 4 screws and the navaid dropped right out of the panel, and 4 screws and the Trio was in and running. I already had a remote servo disconnect I used for the Navaid. I moved 2 moles pins to take advantage of this feature in Trios box and that was it. In minutes I was playing with running. 6. It accepts an "Aviation" data stream, as well as the NMEA format. But the aviation data stream has much more info contained in it. Like waypoint name etc. All can now be displayed on-screen, freeing up the moving map space. This is great. While flight testing the autopilot and flying flight plans using published airways, we often encountered other airplanes using the same airway. While this was usually during climb or descent (for either us or the opposing aircraft) it was a potential safety issue. As more aircraft are using precision GPS receivers to navigate, and many are coupled to autopilots, such close encounters are likely to increase. For this reason, the EZ Pilot incorporates a Track Offset Position (TOP) feature that allows the pilot to select a track offset of up to 1 mile. This places the aircraft away from the course centerline where much of the traffic might be found. It is interesting to note, that if all aircraft positioned themselves to the right of the published course centerline (for instance), opposing traffic would always be on the opposite side of the centerline. A “standard rate turn” of 3 degrees per second may result in a comfortable bank angle at 130 knots, but as speed increases the bank angle must be increased to achieve the standard rate of turn. In faster aircraft this steeper bank may be uncomfortable to some pilots and, indeed, may exceed the capability of an altitude hold system to maintain altitude properly in the turn. To remedy this, the EZ Pilot has a means whereby the users can adjust the maximum rate of turn to their personal satisfaction. When shipped, the EZ Pilot is defaulted to an “automatic” mode where the actual turn rate is automatically adjusted based on groundspeed (as measured by your GPS). For aircraft cruising at groundspeeds of 140 knots or greater the automatic mode will decrease the allowable turn rate to keep the aircraft bank angle at a comfortable maximum of approximately 15 degrees. Slower speeds will allow a standard rate turn of 3 degrees per second. If your cruise groundspeed is typically less than 150 knots, or if you do not mind the higher bank angles at the higher groundspeeds, you may want to select the MANUAL mode. In the MANUAL mode you can set the maximum turn rate to a fixed limit. It is adjustable from 1 degree/sec to as high as 3 degree/sec, in increments of 1/10th degree/sec. In an effort to increase safety and save lives, this mode may be implemented as an emergency aid to the VFR pilot who inadvertently enters IMC conditions and needs to execute an immediate course reversal. It is important to realize that the autopilot must be turned on and receiving a good GPS data signal for proper operation. You may be tracking a flight plan but a sudden IMC encounter may not leave you with an opportunity to reprogram your GPS to invert the flight plan. This procedure does not require you to adjust your GPS receiver. If you are manually flying your aircraft, this procedure will also work because the servo does not have to be engaged to initiate this emergency procedure. 1 The servo will be energized (if off) and the wing leveler function will engage. (back to Mike Stewart's comments) Sam Buchanan and I are both real happy with this thing and its performance. Sam has already spoken to his interest in this unit in RV-list message number #116018. Electric spinning gyro's are history and this company has a roll axis autopilot at a price point that will put all others to shame. (Navaid are you listening? I tried to tell you over the past 3 years you needed to look at this stuff, and here it is!) I can't wait to see the new display and integrated vertical guidance. One thing I don't have and wish I did was altitude pre-select at a reasonable price. Altrak watch out, these guys are knocking on your door. If I were your mother, and you are flying your rv in anything other than severe clear local flights, I would make you put one of these things in your plane. Not only will it take some workload off, but it might save your A#@! one day. I have the new screen and features as of the April release. The new screen work great and is easily sunlight readable. There are only 2 features I now wish I had on this unit. Second, the Navaid head had a knob that allowed me to make a turn at any rate and hold. I have spoken to chuck about this and he is looking into this option also. Also Doug Reeves is installing his too.